"A magnificent monument to the Polish airmen"
"Like an abstract sculpture it perfectly expresses the meaning of the monument." 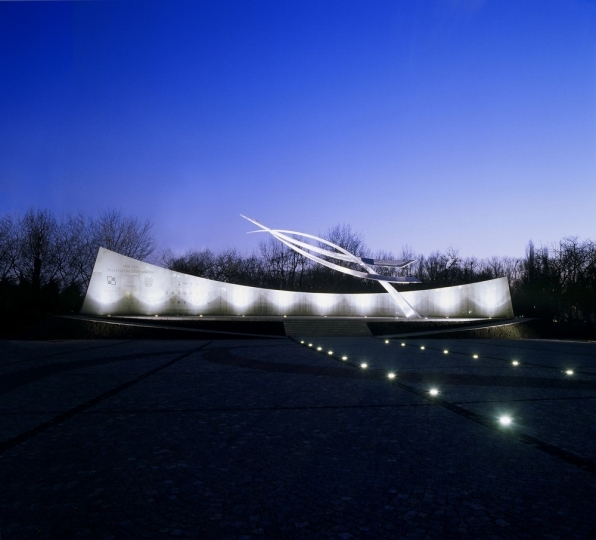 "The design is brilliant in its representation and simplicity"
"...one of Dziewulski's most poetic and moving works"
This is the national memorial to the Polish airmen who fell during World War II. It is set in a prominent location in Pole Mokotowskie, a park in central Warsaw that has special historical significance as the location of the first airfield of the Polish Air Force and is the site from which many of the pilots took off on combat missions. The sculptural forms are intended to convey the youthful spirit and energy possessed by those young pilots. The memorial is intended to be uplifting and optimistic, expressing the pilots’ inspiring passion for freedom, their courage and their faith in their eventual success.